In my latest B/X game, I looked through some maps from Dyson Logos, picked one (I'll share which map once the PCs have finished exploring) and populated it with the Moldvay rules. I used the random encounter list for monster picks, but "improved" on the results with weird and different creatures. I riffed on the dungeon's contents to come up with a backstory for it involving elves and a crown, and off we went. Once again I used Geoffrey McKinney's Dungeon of the Unknown for some of the oddities, including a glop and one of the chimerical beasts. (C15, a smilodon/scorpion creature) that was met with some ferocity from the PCs. They used fire to slay the glop, and chokepoints to fend off my own Devil Monkeys. The leaping capability of the Devil Monkeys made the initial encounter really dramatic, as they lept clear 15 feet over an underground pool to attack the elf who thought he was safe taking pot shots. Moldvay's dungeon generation gives a good balance of rooms. I supplemented it with the AD&D DMG, the Dungeon Alphabet, Ready Ref Sheets, and Dungeon of the Unknown for inspiration. A mix of traditional monsters and new / weird ones hits my sweet spot for D&D play. There's new and challenging encounters, and ones where player familiarity kicks in, like the troglodytes the players have not yet taken care of. The most striking thing about last night's game, though, was how my B/X campaign has worked out fairly well in terms of having a large player pool. In the previous session, several PCs moved on from the Keep on the Borderlands to a town upriver. But none of those PCs made it to last night's session; only the player whose PC had died in the Tower of the Stargazer was in common between the two, so the PCs actually were at the Keep at the start of the game. It's an interesting shift in dynamics. There are a total of 10 living PCs with experience in the roster. Several new 1st level PCs went along with a 2nd level character (dating back to the Stonehell game I was running last year) who made 3rd on this adventure. One thing I've noticed out of this is that the PC group's capability is really driven by the level of the highest level fighters. Since they can take the front lines during a fight, fighters over level 1 really take first level encounters out handily. And of course, numbers still reign supreme; higher level encounters with one monster don't make as much difference as more lower level opponents. B/X D&D is holding up pretty well. I've noticed it has just enough guidelines in the rules to be firm on certain things, but not overwhelming with detail like AD&D 1e can get. A brief discussion of river transport clarified that for me: it has what I want as a referee but no more than I need. 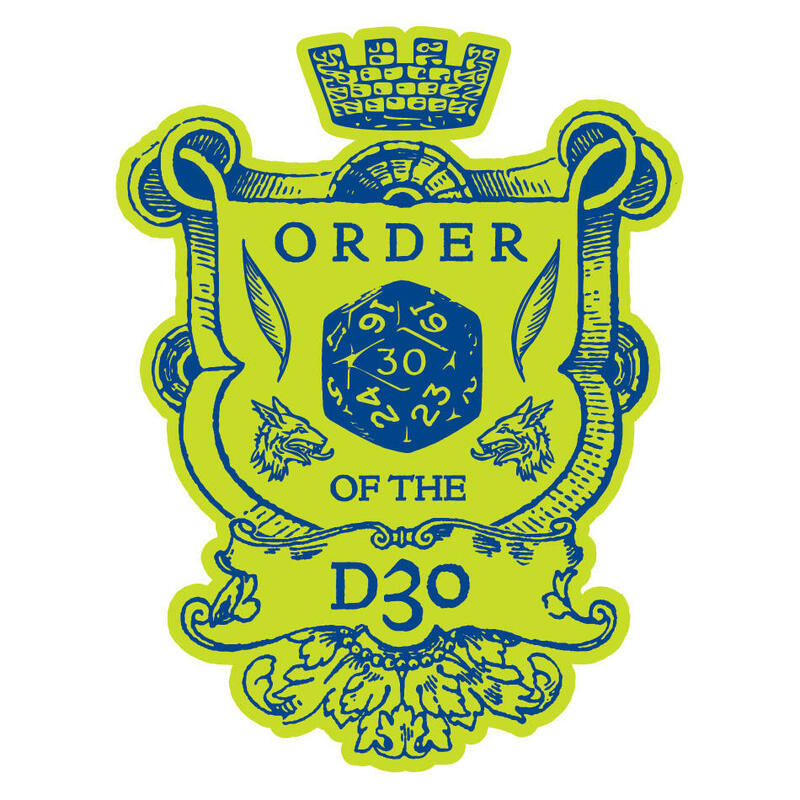 It's really a good, straightforward implementation of OD&D in the ways that matter. In practice I am finding it adapts to what I want a bit more smoothly than either Holmes or Swords & Wizardry did. OD&D of course retains a special spot in my heart, but I have been happy with B/X on the table. This vicious primate originated in Appalachia but is prime for your fantasy realm. Devil Monkeys are a form of primates ranging from 3' to 4' in height, covered in shaggy fur and with long, bushy tails. They are extremely fleet of foot and can leap up to their full 18' movement range in any direction. In combat, they rely upon their vicious sharp claws, though they will sometimes bite. If it makes two successful claw attacks in a round, instead of dealing damage, the Devil Monkey may try to rend armor off of a victim. This takes 2 rounds and the victim may make a saving throw each round to break free of the monkey's grip. These monkeys live in small troops, generally of 10-30 individuals. A large troop may have a leader, who has AC 6  and 4 HD (CL 4/120). Their typical habitat is in the forests of temperate mountains, and Devil Monkeys have a particular hatred of dogs. Their primitive language may be comprehended using a Speak With Animals spell. In the mountains where they live, Devil Monkeys are spoken of in hushed tones. They have been known to rip the roofs of covered wagons off to attack the humans inside. The fear of "death", its risk each time, is one of the most stimulating parts of the game. It therefore behooves the campaign referee to include as many mystifying and dangerous areas as is consistant [sic] with a reasonable chance for survival (remembering that the monster population already threatens this survival). For example, there is no question that a player's character could easily be killed by falling into a pit thirty feet deep or into a shallow pit filled with poisoned spikes, and this is quite undesirable in most instances. - The Underworld & Wilderness Adventure, p. 6. The paragraph above is likely to have been written by the very same author who would later pen S1 Tomb of Horrors; what a difference a few years makes. When you read the list that runs beneath this text, the tricks and traps are definitively different from the list in Appendix G of the Dungeon Masters Guide. It's mostly about confusing mappers and getting PCs lost in the dungeon rather than actually killing them; teleporters, illusions, deceptive corridors, stairs going up or down multiple levels, etc. Whereas by the time Gygax wrote the DMG, it was primarily traps that shoot, stab, burn, drop or poison hapless characters, possibly to their doom. None of this is listed in the OD&D ideas, although there is a pit trap in the sample map. It is not so much an elaboration as a shift in the basic workings of tricks and traps from map hazards to PC killers. I don't think that it's entirely coincidental that the change occurred after Gygax had started to put out printed dungeons that are very different from his original Greyhawk megadungeon. The difference between Dungeon Geomorphs - which are close to what we've seen of the Greyhawk maps in style - and dungeons like G1, G2 and G3, or B2 and S1, is a shift from dungeons where mapping is a key difficulty to more "logical" (but still nonlinear) dungeons that TSR put out in its heyday. Traps reflected the fact that combat and hazards were more likely to involve PCs getting hurt or killed than lost. My love for traps stems from the idea that D&D is basically a hidden map game. Both types of trap have the same basic premise: that navigation of the dungeon should be inherently unsafe. A dungeon is an area hostile to intruders; if it weren't, it would already be cleaned out. But the failure state of the "damage" trap is more quickly resolved than that of the "get lost" trap. In the latter case, the referee is opening up the door for a session of players just trying to find a way out. With a damage trap you either get hurt or you don't. One of the big advantages of damage traps over get-lost traps is that it's easier to create ways to avoid damage traps. If an arrow trap is triggered by a tripwire, then simply not touching the tripwire leaves you safe, trap avoided. You can't really do that with a space distortion corridor (suggested in U&WA) designed to screw up mapping; the referee has just messed with your map but no idea why is given. None of which is to say that get-lost traps have no place in the game. Dead end corridors, one of the original suggestions, are a great feature - particularly if a wandering encounter begins chasing the PCs at a good clip. One way doors are also interesting, because they force the PCs to find a different way out without getting into the whole, "Hey, you're lost and your existing map is FUBAR." And teleporters are just fun, although I prefer the kind that have to be actively touched - there are several great examples in Stonehell that lead to really interesting scenarios. But on the whole I think that get-lost traps should be used sparingly. It seems logical to concentrate traps in front of valuable objects or key lairs, but I think this attitude can be mistaken. If traps always come right in front of the treasure, then players will catch on to the pattern. One trick I particularly like is having traps poised before a turn that leads to a dead-end. Intelligent dungeon denizens will only go down such corridors carefully, but they make a great fake-out moment in dungeon design. Logically what these traps are doing is to catch intruders who are unfamiliar with the local architecture. One thing that OD&D really got right was the rule for triggering traps: "Traps are usually sprung by a roll of 1 or 2 when any character passes over or by them. Pits will open in the same manner." It's a great rule to follow as a referee; you casually roll the die as the PCs are walking; I recommend only rolling once so the flurry of die rolls don't give the game away. Since I casually roll dice frequently in my games it's not noteworthy. And then a session later, the passage that the characters had passed without incident now opens up and someone falls into a pit. It's a great twist, and helps reinforce the idea that the dungeon doesn't become safe with time. Curiously this works much better with the later damage traps than with the get-lost type of traps that OD&D had foregrounded. I'll finish with this. Traps are a spice in the dungeon, and it's definitely possible to go too far with them. I think putting in a trap in 1/6 rooms (the rate you find in Moldvay's rules for dungeon stocking) is a bit much - also that I don't think many traps should be in rooms proper as opposed to corridors. But a dungeon without them is just bland. As for tricks, I'll be doing a follow-up focusing on them. Ready Reference: What book did you find? The tome is an inescapable object of fantasy worlds. This table is for some interesting tomes that PCs may find in their adventures. For a "normal" book, you may want to roll 1d6 or 1d8 instead of 1d12 to avoid the "weirder" entries. What Book Did You Find? A magic-user's spellbook. Roll 2d6 to determine the level of the magic-user and determine the spells available randomly. A religious text. There is a 10% chance it is related to the religion of any given party member; otherwise, it is worth 1d10x5 GP to a member of the appopriate religion. A manual of a particular regional fighting style. A fighter reading the book will add an additional 10% to experience earned only for fighting and defeating enemies for the next 1d6 game weeks. The book is an extensive diary of someone who has explored the area where the book is found. It should give detail on several features in the location. 25% chance that the final entry the diary was written in another hand. A trapped book. Reading it will function as if the spell Feeblemind were cast by a 10th level magic-user. The book is exactly 100 pages in length. There is writing on 90 of the pages. If a character writes a question on the left leaf of any of the blank page spreads, an accurate (although not necessarily complete) answer will appear on the right leaf the following morning. Only one answer will appear per day, and only one question may be written per page. Writing more than one question, or writing on the right leaf, will spoil the effect on that page. The book contains revelations or illustrations of such visceral horror that a character reading it must save vs. spells or be driven mad. A manual on summoning demons. Every ritual takes a minimum of 1 turn and 100 GP of material components. The base chance of success is 25%. Every additional turn or 100 GP of components adds 5% to the chance of success, to a maximum of 75%. Summoning a demon does not give protection, control, or the ability to dismiss it. A book written in a tongue not spoken on this world. Roll again to determine the book's actual contents. A Read Languages spell is needed to read this. If you roll this result again, the subject is completely alien and seems meaningless to the reader. For each entry (except for 12) above, roll 1d100 to determine the language of the book. 81-90: Ancient language; 20% chance that a magic-user can read it. Ready Reference: What Kind of Flower Is That? It's Valentine's Day, so here are some ideas for flowers encountered in your game. An ordinary but pretty flower. +2 to reaction rolls if presented to a sentient creature of the appropriate species and sexuality to be impressed. An ordinary but foul-smelling flower. -2 to reaction rolls generally if touched. An ordinary flower as in 1 above, but a PC is allergic. For the next 1d6 turns, the character is sneezing and all rolls are at -1. Stealth is impossible. An ordinary flower as in 1 above, but a PC is deathly allergic. Save vs poison or the character enters anaphylactic shock (Cure Disease or similar to negate). Death results within 1d6 turns of onset. The flower's petals can be used to create a mild poison (vomiting, penalties to action, etc.). Value is 1-10 GP per intact specimen. The flower's petals can be used to create a severe poison (death, ability score loss, etc.). Value is 50-100 GP per intact specimen. The flower creates a mild drug effect if dried and smoked. 5 GP per intact specimen. The flower is a powerful opiate. 15 GP per intact specimen. 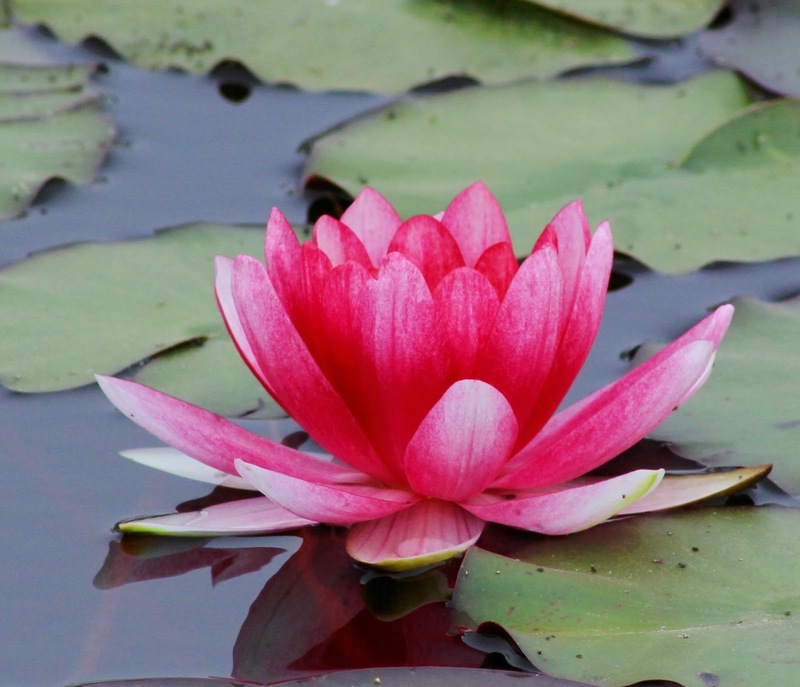 The flower's petals create a powerful hallucinogen. 25 GP per intact specimen. The flower is an ingredient in a magic spell. A wizard may pay up to 100 GP per spell level for an intact specimen. The flower is blessed or cursed (as per the spells), 50% chance of each. Raise/lower a random ability score by 1 point. Causes the imbiber to fall madly in love with the first person they see (follow the rules for Charm Person). Gives the imbiber visions as per Contact Higher Plane. Causes the imbiber to fall asleep until Remove Curse or similar spell is cast. Grants the effect of the spell ESP, Clairvoyance or Clairaudience (2 in 6 chance of each). Grants the ability to cause flowers of the same type to grow spontaneously from any soil. Permanently changes the color of the imbiber's eyes to match the flower. The imbiber slowly changes into a plant-human hybrid. After 3 months, movement is reduced by 75%, hit points by 50%, and there is no longer a need to eat. Requires Cure Disease to stop this process and Remove Curse to reverse it. As a general rule of thumb, the flowers with special properties should have a 25% chance of being transported without significant damage. Tinctures should be unique per flower, not per type. So I figured I'd go through and clarify what I'm going to be doing for the forseeable future on this blog, so hopefully it won't just seem a random jumble. First: When I play D&D or a reasonable substitute, usually on Saturdays, I'll continue to post an Actual Play the next morning. I'll be setting up a game in the not distant future. Second: I want to regularize the features. Cryptid Wednesday will be on Wednesdays, for obvious reasons. Ready Reference will be appearing on Mondays and Fridays. That will give the blog reliable, regular content. I'm going to try and keep a thing or two in the pipeline so I'm not crunching to get an article out. Third: Dungeon Crawl. Remember Dungeon Crawl? Yeah. I'm going to do what I can - probably either late this month or next month - to get the fourth issue out. The problem is, I have other things I want to do in terms of gaming writing and I can't do those and do Dungeon Crawl. So the fourth issue is going to be the last for a while. I won't rule out another at some point, but it just doesn't fit my schedule for now. Fourth: More writing. 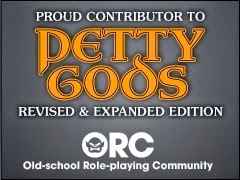 It's been really amazing to see the impact my OD&D setting articles had. Out of several hundred posts on this blog, those have been consistently the most successful and widespread. I can't force that kind of thing, and I just haven't had the itch to do a sustained series on any particular topic over the last few months. Hopefully I'll have something fairly soon, though. Fifth: Guest spots. Specifically, I'm open to having people do guest entries on either Ready Reference or Cryptid Wednesday. If you have a monster or table and want to share it, let me know (my gmail account is wrossi81) and I'll put it up with credit to you. That's what I see as the future for this blog. Hopefully I'll be able to stick to it, and you'll find it interesting. And please check out the Cryptid Wednesday tag. These monsters don't get as many hits as just about anything else I post, and they deserve to be out there killing PCs. Cryptid Wednesday is back with a horror from France. 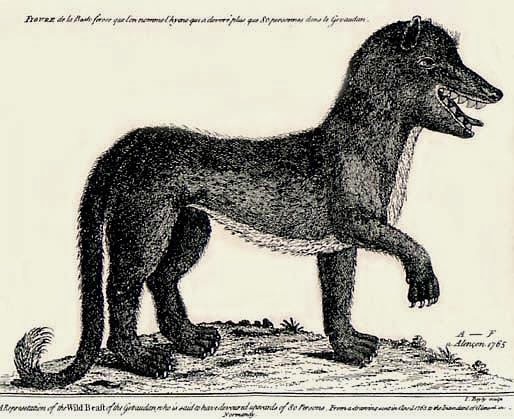 The ferocious beast of Gevaudan is a large creature, resembling a wolf in features but the size of a cow. 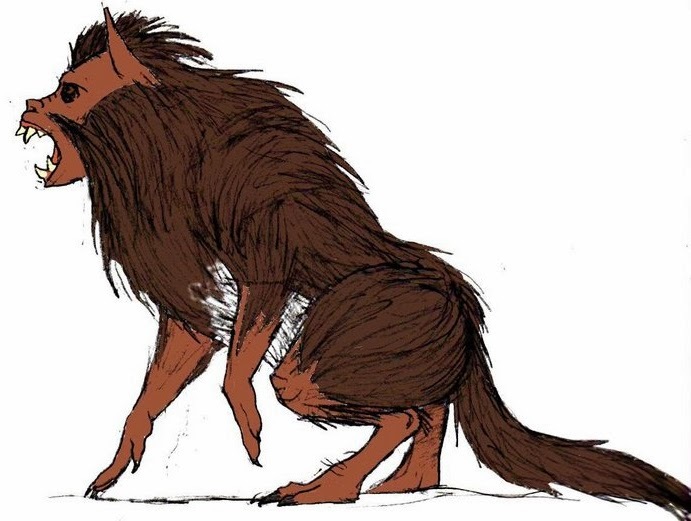 Its fur is blood red with streaks of black, and its hide is mottled and mangy when seen. This is a vicious predator, showing a particular taste for humans as well as large livestock. Its odor is so noxious as to be unbearable. NPCs must make a saving throw or morale check (referee's option) to continue fighting it in melee. In combat the Gevaudan beast will often strike directly for the throat of an opponent with its razor-sharp teeth. It can also use its heavy tail to render an opponent prone. A successful hit removes the next turn's action. It is not clear if the Gevaudan beast is unique, but it is hoped to be. The horror will generally prowl near isolated farming villages. My crowdfunding "score" when it comes to roleplaying games is pretty low, but it's looking like it's more likely to become better in the next month or two, as a bunch of things have been inching toward printing and distribution. Of course I keep digging holes faster than creators can fill them. Here's some notes on the crowdfunding campaigns that are currently out there. The one I'm really jazzed about is LotFP Free RPG Day 2014. This started off focused on Jim Raggi's 2014 Free RPG Day adventure but has turned into a stealth campaign for a module called "World of the Lost" by Rafael Chandler. It's a sandbox that is at least 48 pages but, if it sells 250 copies, will be substantially bigger and better. There's only 40 hours to sell another 100+ copies - but the reward is really great if we get it. The module promises to be a "lost world" style sandbox from the freakish imagination that brought us the Teratic Tome. I'm a bit undecided on the Kickstarter for Scarlet Heroes by Kevin Crawford. I rather like what I have of Crawford's products - An Echo, Resounding, Red Tide and Spears of the Dawn - and I think that Scarlet Heroes will probably be good. It's just that the format of the Kickstarter is a turnoff for me, because it just gets you an "at cost" print on demand version. I would rather only pay once for the book, and as much as I think I'll like it that means I'm inclined to wait for it to be released officially, as I did with Crawford's other products. Then there's Greg Gillespie's Barrowmaze Complete. I like Barrowmaze but I have both books, and I'm not terrifically inclined to shell out $80 for a bit more content. Again I'm inclined to pass and just pick up poster maps since the ones in the printed books are absolutely awful. Is anything else going on? Any other thoughts folks have on these three campaigns? Ready Reference: What's Behind That Loose Stone? A good table should really have some interesting possibilities that are both good and bad. It's with that in mind that I present today's Ready Reference table, "What's Behind That Loose Stone? ", with some good and some bad things that fit behind a loose stone found in a dungeon wall. You'll also notice that there are some creatures here; I'm using a simple pattern of defining AC by armor type and giving HD. This should make it easy to convert to your system of choice. Enjoy! Treasure! Roll 1d12: 1-8, coins; 9-10, gems; 11, jewelry; 12, magic item. Determine as you normally would determine random room contents for the current dungeon level. 1d8 spiders (AC unarmored, HD 1 hp). 25% chance that they will be poisonous. 1d4 rats (AC unarmored, HD 1-2 hp). Successful attack gives 5% chance of disease. A map showing this area of the dungeon. 50% chance of inaccuracies. A book. This may be the diary of a long-ago dungeoneer, the rantings of the mad wizard who created the dungeon, or a religious text. A skeleton. 2 in 6 chance that it is animated. A passageway to elsewhere in the dungeon. The opening will have to be widened before characters can travel through it. The stone conceals a hole in the floor. This may be filled with any liquid, animal, monster or anything else that the referee chooses as appropriate to dungeon level. A small statue, carving or relief of a type appropriate to the dungeon's builder(s). 2 in 6 chance that it will have magical powers. Ooze, slime or mold. Choose from your favorite source of monsters or generate a glop from Geoffrey McKinney's Dungeon of the Unknown. A crystalline intelligence (AC chainmail, HD 2 per cubic foot). It can be contacted by spells such as ESP or other forms of mental communication. If threatened it can create an electric shock for 2d8/cubic foot (save for half). The stone is one of several concealing a portal to another plane, world or dimension. It takes 1-6 turns to clear enough of the wall to go through the portal. Ready Reference: What's Blocking the Corridor? Just to be clear, every "Ready Reference" table provided in this series is going to be in the format of answers to a question. It's not the format of the Judges Guild Ready Ref Sheets, but it's a simple and fun way to make charts that have an immediate use when the referee needs to come up with some relevant details quickly. And it's more fun to come up with this style of answers rather than one-word prompts. The other thing I should be clear about is that the tables are deliberately written to be moderately system agnostic. When necessary I'll refer you to the rules of the specific game you're playing - rather than trying to describe an already existing sub-system. Not that I won't detail new sub-systems when it's appropriate. Giant spiderwebs. Follow the rules for a Web spell as appropriate. A partial cave-in has filled the path with stone or dirt, determined by the referee. 10' sections of dirt take 1 hour to clear a pathway with shovels or 3 hours without shovels; sections of rock take 3 hours. The corridor is filled with refuse from elsewhere in the dungeon to the point where it is impassable. The referee should roll 1d6 to determine number of turns required to work through it. Each turn there is a 25% chance of encountering vermin (referee's choice). Rocks and boulders fill the hallway. It takes 3 hours to clear a 10' section. A magical wall blocks the way (referee's choice of any wall spell). The pathway is blocked by an iron portcullis, rusted shut. Refer to the rules for bending bars and/or lifting gates; a spell such as Knock will also open this. The entire corridor is filled with a gelatin-like substance. There is a 25% chance that it is acidic and causes 1d2 hp damage per round when characters walk through it. A wooden barricade has been erected. Each 10' section of hallway takes 3 turns to hack through if the party has axes; otherwise it takes a full hour. There is a curtain lining the entire width of the hallway. Naturally there are opponents appropriate to the dungeon level waiting in ambush on the other side. A mountain of skulls, meticulously stacked into a pyramid. The remains of some corridor-width monster such as a purple worm fill the hallway. It takes 1 hour to clear each 10' section, and the stench is awful. A red dragon (age category = dungeon level). Roll for initiative. Ready Reference: What's Dripping from the Ceiling? Ordinary cave slime. No effect if touched. Highly acidic cave slime. Will eat away leather/wood or etch patterns in metal if contacted. 1d3 points of damage if exposed to bare skin. Cave slime carrying an exotic disease. Save vs. Poison or characters contacting the slime contract the disease. Refer to your favorite disease rules. Ordinary cave slime. Contains a strong pigment (determine color randomly) and will permanently stain any object or creature coming into contact with it. Phosphorescent cave slime. Bioluminescence is enough to see within 5'. Skin or objects coated with slime will retain this luminescence for 1d6 turns. Blood. 25% chance that it contains a blood-borne disease. The residuum of a powerful magical entity that existed centuries ago. Roll 1d6 to determine an attribute, and a second d6 to determine attribute change. On 1, 2 or 3, subtract the number rolled from the attribute; on 4, 5, or 6, subtract 3 and add the difference (1, 2, or 3). Cave slime that is conspicuously green, but totally harmless.